From the estate of Marilyn Monroe, this collection includes one container of Erno Laszlo cream, one container of Erno Laszlo face powder, one container of Erno Laszlo ‘blush’ cream and a bottle of Erno Laszlo fluid. 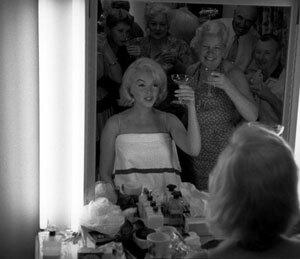 Note the jar and bottles of Erno Laszlo makeup on the table in front of Marilyn in the above photo. 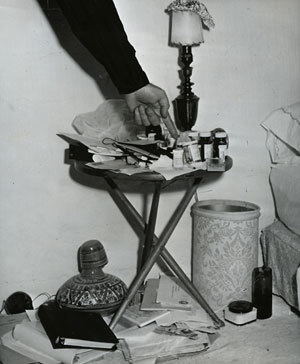 Erno Laszlo was probably a favorite beauty product of Marilyn’s based on the large amount of Laszlo products in her possession at the time of her death. 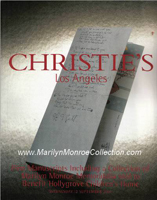 Note the jar of Erno Laszlo makeup on the floor next to Marilyn’s bed in this photo taken by the Los Angeles Police Department as part of their investigation into Marilyn’s death.